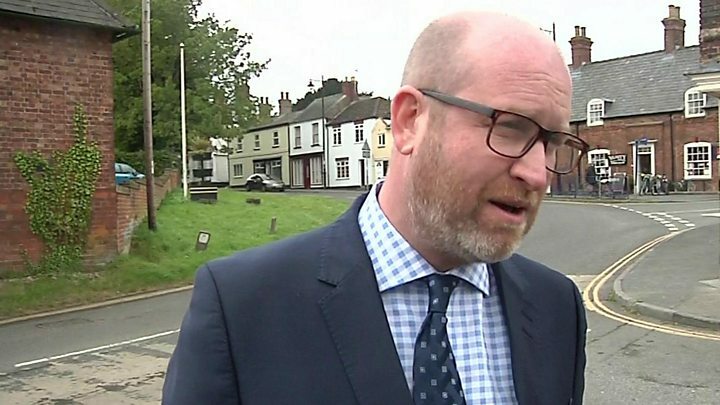 Media captionPaul Nuttall: "UKIP expected local elections to be hard"
UKIP leader Paul Nuttall has insisted its local election drubbing was not a disaster and voters will come back when Theresa May "buckles" over Brexit. Speaking for the first time since it lost all but one of its county council seats, he said the rout was expected and UKIP's future was still bright. People would return to UKIP when the prime minister began to "barter" things away in EU negotiations, he claimed. Several former UKIP politicians have argued its days are numbered. UKIP won 3.8 million votes at the last general election in 2015 but many believe that its vote will be badly squeezed on 8 June, with the Conservatives being the main beneficiary. According to analysis by polling expert John Curtice, if the results of Thursday's polls in Wales, Scotland and 32 county councils in England were repeated nationally, the Conservatives would be on 38%, Labour 27%, the Lib Dems 18% and UKIP 5%. All the 145 UKIP councillors defending their seats on Thursday were beaten, although the party did pick up one seat in Burnley. In Lincolnshire, the party went from being the opposition on the council to being eliminated entirely. It was also left without any representation in Cambridgeshire, Essex and Hampshire. Mr Nuttall, who is standing in Boston and Skegness at the general election, said there had been "clear movement" of votes from his party to the Conservatives but he believed this shift was only temporary. "That was always going to happen," he said. "Theresa May has called this election, primarily because she wants to get it out of the way before the negotiations start. So it's very easy to talk the talk and act tough. "But when she's asked to walk the walk I think there's going to be problems. I think she'll start to barter things away. "I think fisheries will go. I think they'll be some sort of movement on immigration and freedom of movement. I think she might buckle on that. "And I think she'll certainly buckle on a divorce bill. So when people are angry, when people feel like they've been let down, when people feel that they're not getting the Brexit they voted for on 23 June, where are they going to? They're going to return to UKIP. So the future of UKIP is very bright indeed." UKIP is targeting only a handful of seats next month, having said it will not put up candidates in constituencies where leading Tory Brexiteers are potentially under threat. Arron Banks, one of the party's leading donors, has accused Mr Nuttall of "crashing the car" since he took over, while ex-MEP Steven Woolfe and former MP Douglas Carswell have said the party's influence is effectively over, urging supporters to rally behind Mrs May. But former UKIP leader Nigel Farage has said the party should not be written off.